BOROUGH PARK — The city council voted to remove Councilman Kalman Yeger from the Immigration Committee on Tuesday over his remarks on March 27th about Palestine. Of the 44 lawmakers present, 35 voted in favor, seven against and two abstained. 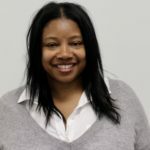 Yeger first came under fire for tweeting “Palestine does not exist,” after a Bklyner reporter Zainab Iqbal quote-tweeted the councilman’s remarks of Congresswoman Ilhan Omar. Speaker Corey Johnson — after several lawmakers spoke out against Yeger —released a statement denouncing Yeger’s comments and called to strip the Boro Park lawmaker of his committee seat. 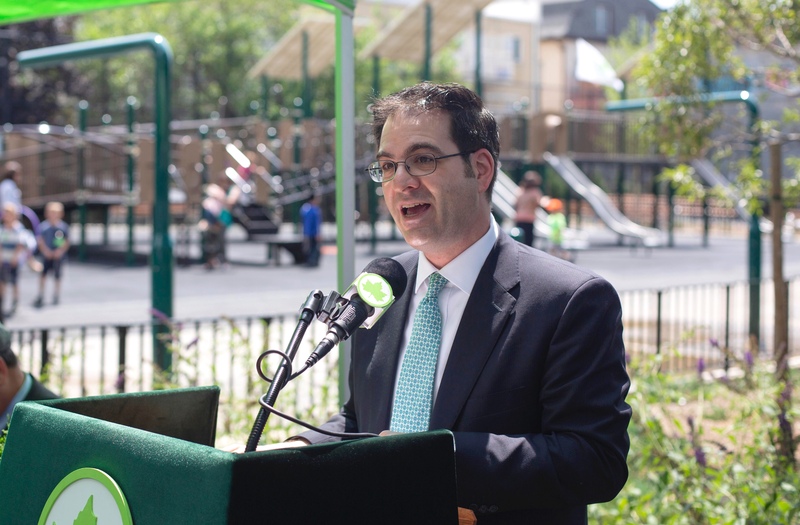 Of the seven council members who voted against Resolution 841, two were from Brooklyn—Councilman Alan Maisel and Yeger’s cousin, Councilman Chaim Deutsch of Sheepshead Bay. Yeger’s twitter battle sparked a protest of about 20 Palestinians and supporters who gathered outside the councilman’s office, to which nearly 200 counterprotesters also attended. Former Assembly Dov Hikind seemed to have led the counter-protesters that erupted days after the initial tweet controversy. 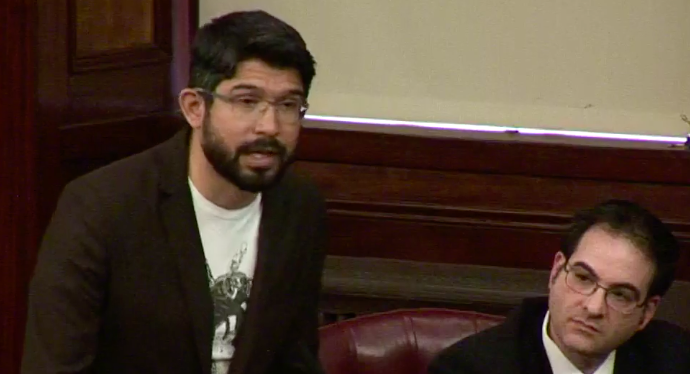 During the stated meeting, Councilman Carlos Menchaca, who chairs the immigration committee, also explained his decision to remove his colleague, Yeger, from the Immigration Committee. Both Majority Leader Laurie Cumbo and Councilman Brad Lander also asked to explain their vote. “I do not believe Councilmember Yeger is a bigot,” said Councilman Brad Lander who in his speech also condemned recent anti-Semitic threats of violence he said Yeger and his staff had experienced since the March fallout. The councilman ultimately voted in favor to remove Yeger from his committee post, as did Councilman Mark Treyger from Coney Island. “While my colleague may have believed that his tweets were glib or idle, we’ve heard from many Palestinian New Yorkers about the harm and hurt his comments have caused them and their children,” Treyger said. A useless committee, with zero power over anything except making “resolutions” released Yeger for stating a fact because it might have offended people who wish the fact were not so. Orwellian if there was any real consequence. Even though he did not say it and you cannot put words in his mouth, the fact is there is no current “Palestine.” In fact get real – there are therefore no Palestinians in fact. There are Jordanians and persons in Israel and other Arabic states who identify as Palestinian. There was indeed a Palestine before 1948, and the people who lived on that land didn’t suddenly disappear just like the indigenous people of what we now call America didn’t disappear, though, as in Israel, it wasn’t without good effort. If no one has a right to define who may identify as Jewish, you have no right to decide who may identify as Palestinian.